Morgan Phillips Cakes: Why Come to the CIA? Why Come to the CIA? The very first weekend I was here, I shared a couch with this guy while we watched the premier of his latest appearance on the Food Network- an episode of Sugar Dome Challenge. 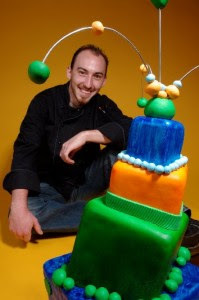 He graduated from the CIA in 2009 and now owns a successful cake shop here in the Hudson Valley. He's been on Food Network Challenge 3 times already and offered a really unique perspective on what really happens on Food TV. Did I mention we got to meet him because he was a judge for the annual cake competition held by the Baking and Pastry Society here at the CIA? That was pretty cool too. On week two I sat in on a lecture and question and answer session given by Michael Specter from The New Yorker on Genetically Modified Organisms in our food system today. He's given a TED talk that was revered by Bill Gates and he's a very well respected journalist on science and technology. Since I'm super interested in sustainable farming, eating local, and all that jazz, I found this really unique. His lecture was nothing like I was expecting, and was actually in defense of GMO's as a way to sustain the food supply, but it was a really interesting perspective to hear. Just the fact that such a respected science journalist came to a culinary school to speak is notable. Week three can be summed up in two words: donut icecream. We had an entire class devoted to eating it. Life. Changing. Since the first second I got here, everyone has been buzzing over the opening of the newest restaurant on campus, Bocuse, and the huge celebration the school was planning to kick it off. A celebration that included a panel discussion with five of the best chefs in the WORLD. That's right- I was in the same room (as was the entire rest of the school) as french chefs Paul Bocuse (named the chef of the century), his son Jerome Bocuse, Daniel Boulud, Jean-Georges Congerichten and American rock star chef Thomas Keller. All five of these chefs are judges at the Bocuse D'or competition that is considered the unofficial Culinary World Championships...they're that good. "If you think you've succeeded, then you've already failed." Happy Birthday Chef Bocuse! It was a huge sight to see all of the excitement that went into his arrival and presence on campus. All five chefs are an inspiration to every single student here. Post-externship Baking and Pastry students worked on this cake for over a month. The inside is all foam but all of the decorations on the outside are edible and made from sugar by hand. If I've gotten to do all of this in the first month and a half of being here, I'm confident in saying that I made the right move. What I'm getting out of the CIA is irreplaceable, and will only mean good things for my career and my customers. The biggest problem is that I've been so busy doing cool things that I haven't had much of a chance to post about it! Now that I'm all settled in though there will be plenty of cake coming this way soon. Labels: Culinary Institute of America, culinary school, Daniel Boulud, Jean-Georges Vongerichten, Jerome Bocuse, Paul Bocuse, Thomas Keller, Why CIA?